If you had approached Gloucester Road from Christ Church in the middle of the 19th C, your eyes would have been drawn to the picturesque grounds which surrounded the most noble of Alstone residences, namely, Alstone Lawn. It was one of the largest residences in Cheltenham and stood in grounds of just over seven acres on the south-west corner of the Alstone Lane-Gloucester Road junction and adjacent to the lands and no less noble residence of Alstone Lodge. Although it is not known just when it was built, or by whom, but the earliest occupants traced are the Sealy family. The Cheltenham Manor Court Rolls show that a William Sealy was gaining copyhold possession of land in Alstone between 1805 and 1806, which would appear to have consolidated an estate already held. In October 1808 he made arrangements to settle the property on future heirs, and in May 1809 a wife, Elizabeth Greville, is mentioned. The Grevilles were an important local family and had links with Arle. In 1811, Thomas Henry Sealy was born at the house. He was to be a much-celebrated writer and poet in early Victorian times. Like many young men of that era probably did the Grand Tour and after his adventures in Europe settled down to writing. He was editor of 'The Western Archaeological Magazine' for some years and also founded a weekly Newspaper, the 'Great Western Advertiser' but unfortunately this brought him financial ruin with losses estimated at £12,000 - a considerable sum for those days. Not surprisingly, his health suffered and he died in 1848 aged only 37 years. Although his name is now largely forgotten, even in literary circles, Thomas Henry Sealy was still mentioned in Cheltenham Guidebooks into the 1920's. The next owner of Alstone Lawn was William Hinds Prescod, a Jamaica Planter, and his wife Mary. Prescod was a great friend of L. C. Fulwar Cravan of Brockhampton Park, and was evidently quite conspicuous in Cheltenham because he drove about in a blue or yellow chariot. He and his wife had no children but they adopted Mary Gurney, the second daughter of a near neighbour of theirs. 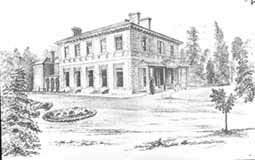 Mary's natural parents, William and Mary Gurney, lived at Maryville, a stone- built house just west of Alpha House in St. George's Road, which still stands, like Alpha House- now part of Spirax Sarco complex. William Hinds Prescod died in 1848 leaving Alstone Lawn to his wife and adopted daughter, Mary Prescod Gurney. 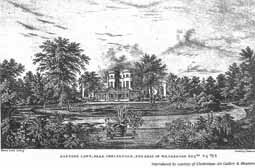 In 1853, the latter married Fenwick Bulmer de Sales La Terriere and the couple lived at Alstone Lawn following the death of Mary Prescod in 1860. Fenwick came from quite a distinguished family: his paternal grandfather, Pierre de Sales was a doctor, manager of a forge business and general entrepreneur, who emigrated from Albi in France to Quebec. Fenwick's maternal grandfather was Sir Fenwick Bulmer, who had been the King's physician. The 1861 Census returns for Alstone Lawn show a family of considerable wealth, the live-in servants listed included a nurse, cook, butler, groom (plus family) housemaid, under-nurse and under- housemaid as well as a gardener and his family living in the entrance lodge on Gloucester Road. One would imagine the family took part in the various social events which took place in Cheltenham. One thing is fairly certain - they would have had little contact with their close neighbours, the Higgs. Both Fenwick and his brother, William, who lived at Marle Hill, were keen sportsmen who were part of the Cheltenham Racing scene. Mary Prescod de Sales La Terriere died at Alstone Lawn on 11th September, 1911 and was buried in the family grave at Swindon Village Churchyard. She left three daughters and a son and had lived in the house all her married life and for most of her childhood. Alstone Lawn was not lived in again. It was put up for auction the following year, but failed to sell, possibly because, by that time. Lower Alstone was becoming industrialised and rich buyers were looking for more salubrious and attractive places to reside. On Sunday 21st December 1913, Alstone Lawn was the target of a suffragette arson attack. Flames were spotted coming from the roof of the empty house at 5 am and the fire brigade immediately summoned. Every member of the brigade turned out in response and the blaze was soon brought under control. The wooden staircase in the centre of the house was completely destroyed and a hole about 10 feet across was left in the roof but the rest of the house was undamaged. The two women proved uncooperative when taken into custody. The police had to remove the women's boots which they then refused to put back on. They refused to give their names, and so were named 'Red' and 'Black' on the charge sheet and hardly spoke except to complain of man- made laws'. The women were subsequently taken by train to Worcester Gaol to await trial. Following the breach in the roof of Alstone Lawn, it seems the property was left to decay. The 1923 OS Map shows that the house had been demolished and the area used as allotments. On 28th January 1933 the estate was sold by the La Terriere trustees to the Borough of Cheltenham. Later that year the development of Pates Avenue was begun on the site, to house families displaced by the slum clearance scheme of Swindon Place / Swindon Passage. In 1934 plots were sold on which the shops on the corner of Alstone Lane were built, followed soon after by houses on Gloucester Road. Today there is no trace of that once impressive and beautiful mansion which was Alstone Lawn but if you wander along Gloucester Road you will come across a narrow lane leading to what was called the Vineyards and along there is part of an brick wall with a curved ramped coping at one end - perhaps part of the original estate boundary wall! This former building, believed to be of 16th C origin, once stood in Six Chimneys Lane (now Arle Avenue) adjacent to the Mill and belonged to the farm which was purchased by Jesus College, Oxford, from one James Beckett on 26/11/1726. Whether it was always known by that name is doubtful. It is more likely the name was acquired in later years because of the distinctive six chimneys. The acreage of the farm at that time was approximately 120 acres of which 114.5 were copyhold and it extended from Gloucester Road alongside and to the east of the River Chelt to the Arle border. In 1741 Green Close, Alstone, and in 1783 Brook House, were added to Jesus College holdings and both stood adjacent to the farm house and the mill, which was, at that time, a working mill. It is difficult to tell from the photograph below the actual architectural features of this rather spooky-looking place, but the six tall chimneys were a feature of Tudor architecture and certainly documentation points to it as being possibly 16th century. 'A farmhouse being a roomy square building comprising a sitting room Parlour and closet upon the ground floor and four garrets built with bricks and plaster on the outside.' But the complete survey shows that much re-timbering was needed and was in risk of taking fire. The brickwork also needed re-pointing. There were also hen houses, stables and pig sties which appeared to be in better condition than the house itself There was, in addition, a long brick cow-shed covered with pantiles and in good repair and also a wagon shed. The most vital repair needed was to the under-pinning which was insufficient to keep the building from rocking about by the wind and it seems clear that the animals enjoyed a safer and more comfortable environment than the occupants of the farmhouse. It would appear, however, that no real work was done till c 1859 when extensive work was carried out by R P Davidson of Stroud and Oxford for the sum of £126.0.0 with an additional charge of £20 for repairs to the stable. There were, of course, over the years, various tenants and in the middle of the 19th C according to the census returns, it was occupied by one William Moss. His daughter married George Prude and when Moss died, Prude took over the running of the farm with the consent of Jesus College. It was the first of these purchasers which most keenly affected the landscape of Alstone for the railway cut across the farmland and led to development on both sides: added to which the Gas Works soon spread over a large part of the land to the east of the Chelt and took in part of Six Chimneys Farm, but it was the purchase by The Cheltenham Corporation which led, indirectly to the final destruction of this ancient site; the land being purchased for a school which was originally called The Central School and later became the Technical High School. Quite possibly at least three generations of local children attended the school till it was amalgamated with the new Bournside School at Hatherley. In the 1930's Six Chimneys Lane became Arle Avenue and the housing development which ensued on the South side led to the demolition of the old Farm House and so, once again, another piece of ancient history disappeared from Alstone, but perhaps one might suggest, poetic justice! For even the old School is no more and yet another housing development stands on the former site - called Scholars Close. The farmhouse is a roomy square building comprising the sitting room, parlour and closet upon the ground floor, and four garrets built with bricks and plaster on the outside and The dormer gutters and part of the timber are very indifferent and want repairing, also the garret floors. The parlour fire place should be altered as the timber about it is in danger of taking fire and the spouts round the house want repair and pointing: also a kitchen detached of bricks, covered with blue slates and in pretty good repair. Also a range of hen houses used for bricks, thatched in pretty good repair. Also good stable with a chamber over it of bricks: the slates, the doors and the steps to the chamber want repairing. Also a small stable adjoining of bricks. The roofing of this building must be taken off and wholly repaired. Also a range of pig sties of bricks and pantiles in pretty good condition. Also large range of barnes with two chambers, floors (one of which is in good state, but the other is very indifferent). Part of bricks in panels and part of laths in panels, and thatched; the whole is olde and several repairs are wanted, particularly to the thatch at the back part. Also a loose box adjoining the barns of bricks and pantiles in tolerable repair. Also a long cow shed of bricks at the back part and timber posts in front, covered with pantiles and together in good repair with a good brick wall round the area. Also a wagon shed of bricks covered with pantiles and in good repair. The paling and gates to the area want repair; the garden enclosed next the back lane is in bad repair and instead of using timber a brick wall should be built. The paddock paling also wants repair. There is also a large tenement called the brook house comprising two rooms on the ground floor, two chambers and two garrets of timber and lath and plaster in panels, the whole is very old. Under-pinning is insufficient to keep the building from rocking about by the wind and considerable repair to every part is necessary. There is a good garden to this tenement with about a dozen fruit trees, some of which are small and another small plot at the end of the orchard and near to the tenement, formerly a stable but now occupied by a glove cleaner, of bricks and lathe and plaster in panels, thatched: Part of this building has been converted into a small cottage; the whole is old but the thatch is in tolerable repair. The whole of the estate is subject to tithes which are now generally taken in kind. The house is conveniently situated and not more than about half a mile from the town of Cheltenham. The parochial rates are not high for the extent of land, but labour in consequence of the farm being near to Cheltenham is sometimes very high. The land tax is redeemed. The greater part of the land is of inferior quality and expensive to cultivate; there are , however, several pieces of pasture land of a pretty god description but they are materially reduced in value as a consequence of a public footpath passing through them which causes much damage to be done to crops and grass. In consequence of the prices of agricultural produce being very low, with but little prospect of a permanent improvement, the estate occupied as a farm is not capable of bearing the advance of rent. The rental might, however, probably be in creased for some pieces if the land were let out in several parcels but such a step, I am not at all disposed to encourage inasmuch as I think the common field part could not be let or cultivated to advantage without the assistance of the grass part of the farm. There are, however, several pieces of arrable land near to the property of Mr. Thomson at the Wells at Cheltenham, very likely to be let in time but? than those for the common purpose of agriculture and in case a lease of the farm is granted, I think it would be adviseable to have the privilege of requiring possession although of giving the tenant six months notice and allowing him an abatement in proportion to the general rent of the farm and extent of land that ,might be taken. The repairs necessary are of importance and should be attended to as soon as possible and necessary timber should be assigned. The Covenant and Conditions in the lease are suitable and proper and may be observed on granting a new lease for 12 years, determinable at the end of the first 8 years, from six months previous notice being given by either party. College will in all probability be put to considerable expence upon his quitting and another tenant taking it. I think it right to add that an increased income might probably be made in letting part of the land to brick making but as this would ultimately reduce the value of this estate unless building leases were granted, it is a matter for the consideration and decision of the Society. This dwelling, still standing in what was once Six Chimneys Lane but is now Arle Avenue, opposite the site of Lower Alstone Mill, is believed to be of early 18th C origin. 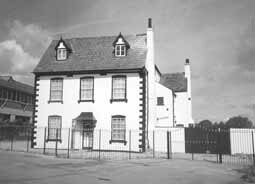 It stood diagonally opposite to Six Chimney Farm House and was mentioned in the Manor Court Rolls from the early 18th C as being in the possession of one Richard Hyett. Goding, one of the 18th C writers says . . .' Mr. Hiett hath a fine house here' . . and a fine house it appeared to be and was probably typical of a gentleman's residence. Richard Hyett c 1681 - 1724 was the only son of Richard Hyett of Arle who also owned land in Bishops Cleve. In 1682 Richard the younger married Mary, daughter of John Browne of Churchdown, in Gloucester Cathedral. The Browne's also had properties in Gloucestershire and were classed as gentry. Anne married Richard Beckett of the Beckett family who owned a lot of land in Alstone. Daughter Mary married the Rev Alexander but Sarah and Elizabeth remained spinsters. Richard, in his will left his properties to his daughters but, for some reason, failed to include Mary so that she and her husband had to apply through the manor courts to claim her share of the estate. The family have a tomb in Cheltenham Parish Church. After the death of Richard the property seemed to have passed into the hands of several different tenants, until it was acquired in 1787 by Jesus College, Oxon, who already owned Six Chimneys Farm. Looking at the house today in its not very imposing neighbourhood, it is hard to picture it as it must have looked when the Hyetts lived there, but fortunately, Richard not only left a will but a very lengthy Inventory which described the property, room by room, and its contents. It was a family residence and would seem to have been self-supporting judging from the inventory which was drawn up and attested by neighbours - Charles Roberts and Samuel Drinkwater, who valued the whole as being worth £268.5.0 and to equate that with today's values one needs to multiply by approx 50. It is the contents which give us a clue to the family life of the early 18th C for it is assessed, room by room, starting with the kitchen where one would expect to find the usual utensils. One intriguing item was a dog wheel. This was a kind of spit attached to a cylindrical cage into which a poor unfortunate dog ran endlessly thus turning the spit on which a piece of meat was attached. (No Animal Rights people in those days!) But in addition to the usual kitchen utensils, Richard also kept 3 guns and a brace of pistols. In the upstairs chambers the beds would probably have been four-posters with hangings and feather mattresses and pillows, and in those days houses had few hearths so there would be no heating in the upper rooms which was why warming pans were used. The Hearth Tax indicates the number of hearths in a house and judging by the fire-irons mentioned in the inventory, it would seem that, apart from the kitchen, only the parlour and probably, the chamber above were heated. People must have been much hardier in those days. They, or more probably, their servants, obviously made cheeses and brewed their own ale, and milk would have been brought from their Westall Green property. Pigs were kept but horses were kept at Westall but the property was really not far from the heart of Cheltenham itself. After Jesus College acquired it there seems to be a gap in tenancy and it is not until the middle of the 19th C that we learn one Daniel Cook and his family inhabited it. The Cooks were a well-known family in Alstone who farmed most of the area. Daniel Cook remained in that house and, according to his will, seems to have prospered with his market gardening and shortly before his death, he his wife and unmarried son, Charles Dovey Cook moved to Hazeldene on the London Road. In his Will Daniel gave his youngest son, Frank Daniel the option to purchase the house for £1,000 and it seems he did so for he lived there with his family for a few years but later we find Mr. Prude of Six Chimneys Farm, living there. As, by that time. the whole of Six Chimneys Farm was being split up and sold, Mr. Prude needed alternative accommodation. But that was not the end of the story, for it being adjacent to the fell-mongering business of A H Taylor and Co , it wasn't long before the premises were incorporated into the business. Thus followed the decline of this once gracious residence. With the building being done along the Lane now called Arle Avenue, the proximity of the smelly Skin yard with its fat-rendering business, soon got neighbours' backs up. Here followed years of complaints, not just from adjacent residents but others further afield who could no longer tolerate the noxious smells which were unbearable at the height of the summer.Eventually the business was forced to close down, much to the jubilation of the nearby residents and although Tesco earlier had enquired about the site, it lay empty for a few years until the Jenner Family purchased the house. They are painstakingly and lovingly restoring it and so, at least, one part of the early history of Alstone has been saved. 3 sett of window curtains 7s6d. One tortoise shell watch studded £2.2s. One table board and a Salt table 2s6d. One iron Crane & 5 links 5s. Since the average cottage in Lower Alstone in the 19th C contained two to three rooms downstairs and possibly three rooms upstairs; no bathroom and often no water laid on, it isn't difficult to imagine what life was like in those dwellings, especially when there was a large family living there. Compare this therefore, with Alstone Lodge - described as 'A Family Residence on the outskirts of the Fashionable Town of Cheltenham'. It stood at the junction of Sandfield Road (now Arle Road) and Gloucester Road, opposite the Shrubbery. It was a white stuccoed building which had a vestibule and entrance hall with plate glass screen and folding doors which led into the entrance hall from which an oak staircase led to the upper floor, where there were ten bedrooms, two dressing-rooms, a drawing room 25' x 17' and a dining room 26' x 16'6" which would have been more than adequate for this large family. There was also a breakfast room 19' x 17' which had a pleasant outlook on the extensive grounds. There was also a well-stocked library which had a height of about 13' and was fitted with handsome statuary and other elegantly-designed marble chimney pieces, all offset with bold and enriched cornices and plate glass windows throughout. In addition to these family rooms the domestic offices comprised - Servants' hall, butler's pantry with inner bedroom; kitchen, scullery, larder, coal cellar, knife house etc., and also a capital cellarage which, no doubt, held an excellent stock of wines. This was the house itself, but there was also convenient stabling and coach houses, plus cow-house, cart sheds, greenhouses etc., and Gas was laid on throughout the house which had its own water supply. The mansion was approached by a pair of massive gates with carriage drive and the residence itself was entered by a long veranda and portico. Who were the fortunate residents of this grand property, which nestled almost cheek-by-jowl, with less salubrious neighbours in Alstone Lane? In 1831 the widow of the former owner - Mrs. Harriet Semper, sold the property to George Matthew Daubeny Esq. of Clifton, for the sum of �3,500 and the Daubeny family resided there throughout most of the 19th C. George and his wife had twelve children in all between 1832 and 1850. It is hardly surprising, therefore, that Elizabeth's death followed soon after the last child, for death in childbirth was not restricted just to the poor. The family, like most of the gentry had several servants but one would have expected, in this large female household, to see a ladies' maid, but perhaps the girls helped each other into their tight Victorian corsets and their voluminous layers of petticoats. It does not appear that any of them married and one wonders why. Alas no portraits or descriptions survive, and one can only conjecture - did they lack the beauty to snare a suitor or was the prospect of providing dowries for them all, beyond the pocket of George Matthew! However, here they resided, no doubt filling their time by gentle walks in the grounds or taking the carriage to the Spas where they would meet other gentry taking the water. Like most Victorian young ladies, they would have embroidered and read suitable books from their father's well-stocked library, and may have had the task of dusting their father's valuable collection of ornaments, which could not possibly have been left to the clumsy ministrations of the parlourmaid. At night they would have retired to their four-poster beds. Not for them a straw mattress on the floor! However, their life was to change for the death of George Matthew Daubeny in 1881 the house was put up for sale. It was auctioned separately from the contents but it reached only �3400, �100 less than George had paid for it in 1831. The contents, however, excited much more interest and prospective buyers and dealers came from far and wide to bid for the valuable collection of works of art accumulated over the years. Eventually in 1883 the house was sold to Mr. Edward W Wilkins of Gloucester who resided there for some time, but in 1896 he sold approximately half the estate to one F H Collins and the other half, including he mansion was sold to G H Mills for �1700. Mr. Mills, being in default of a loan worth �6000, was obliged to sell it in 1899 to Mr. H W Holliday, Butcher, who, in turn sold on to Richard R Pearce and Walter H Pearce of Cheltenham, Builders Merchants for the sum of �2350, the whole of Alstone Lodge Estate. And so, by 1904, the destruction of this once elegant mansion and lovely grounds went ahead and gradually, Alstone Avenue and Alstone Crescent on Gloucester Road took its place. Ironically, as in the case of Arle, the mansions of the gentry disappeared whilst the ancient cottages of the labourers survived and can still be seen.